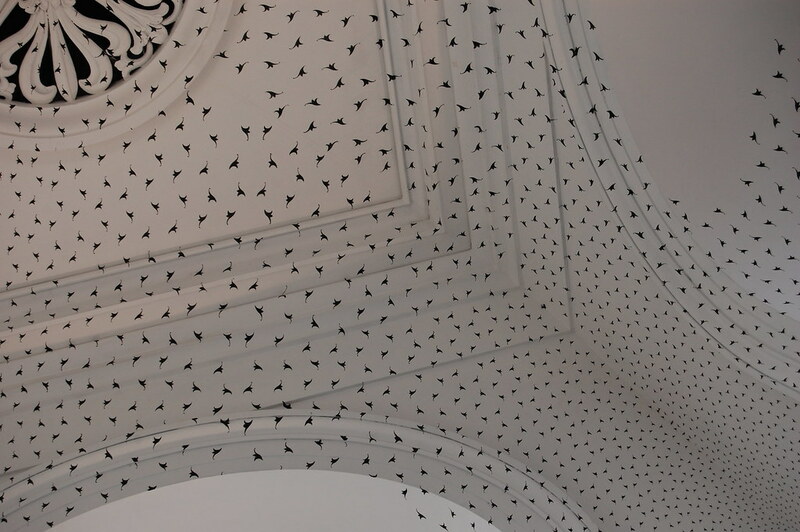 It’s easy to miss Richard Wright’s new permanent installation at Edinburgh’s Dean Gallery. 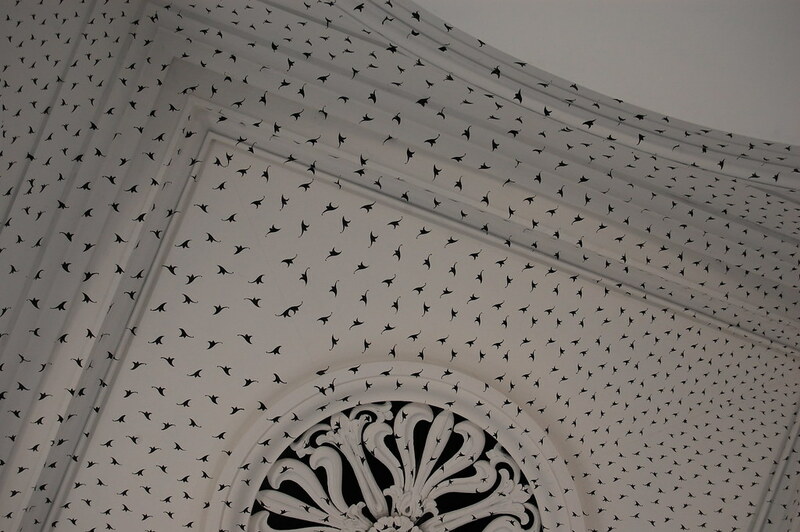 Titled The Stairwell Project (2010), the 2009 Turner Prize winner’s work is made of hundreds of flower-like shapes that are painted with black paint (from “two small pots,” according to the artist) in an undulating pattern on the ceiling of the museum’s west stairwell. Run up the stairs to see the Surrealism show on view on the first floor (as I did), and you will fly past the piece. However, if you do spot it (as I did eventually, after asking a staff member at the museum), you are likely to be entranced for a while. 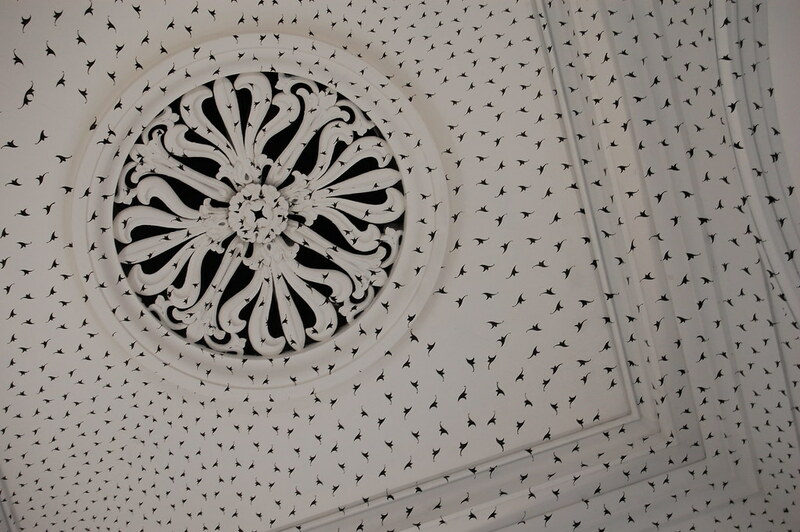 The repeating motif, which changes size and shape depending on its place on the ceiling, is based on the honeysuckle design of the stairwell’s centerpiece, created by architect Thomas Hamilton in 1830. While Wright’s floating flowers may look like relatively straightforward — even innocuous — ornaments, Scottish National Gallery of Modern Art chief curator Keith Hartley convincingly argues in an essay available at the museum that they have a “menacing aspect.” For Hartley, they “make one mindful of the generations and generations of orphans who climbed and descended the stairs of the building when it used to be an orphanage, the Dean Orphan Hospital.” The abstract images also “take on more ominous connotations of disease, sickness and death,” he writes, noting that “[c]hild mortality in the nineteenth and twentieth centuries was much higher than it is today.” It’s an aggressive curatorial reading, but, given Wright’s stated interest in the site-specificity of his wall paintings, I’ll buy it. What I won’t buy is Hartley’s claim that Wright’s move from canvas to wall and (by extension) the current commission represent successful responses to the fact that painting was “being traded so nakedly as a commodity” at the time that he was establishing himself as an artist in the 1980s and 1990s. Wright “felt alienated by the climate of greed and by the control of the marketplace,” Hartley reasons, apparently refusing to accept that the rarefied worlds of museum commissions and institutional awards (e.g. the Turner Prize) that Wright moved into involve markets and competition of their own. 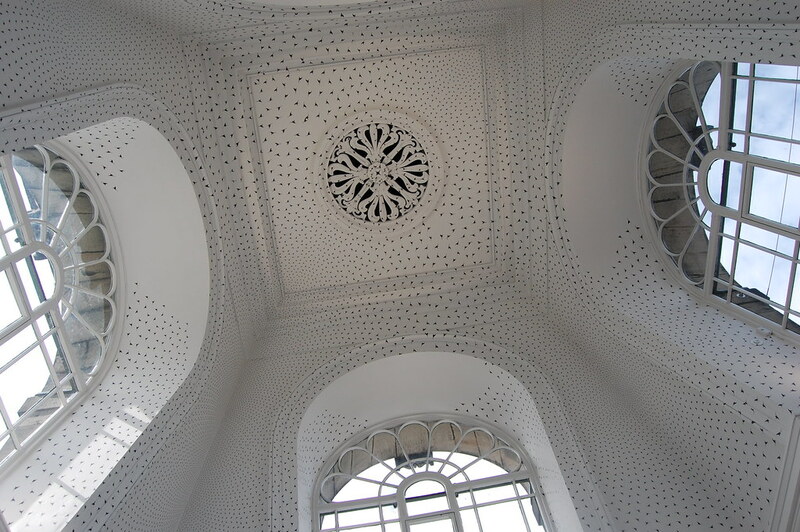 Wright, let’s be clear, was a Scottish artist who had won institutional approval by the time of the commission and was picked to create a ceiling painting that most people will read as a work of beautiful, tantalizing abstract art. There’s nothing wrong with that: it’s a solid work of art, and Wright deserves his accolades. (Also, it seems worth noting that he’s represented by Gagosian, so one imagines he must also be competing in that tawdry commercial marketplace — and, one hopes, bringing in big money). However, Hartley shouldn’t be able to claim that the commission exists apart from the market. He can have his curatorial cake, but he can’t eat it too.